This first table shows us that seven of the top ten days with the most new highs came during the bull run of the 1990’s. 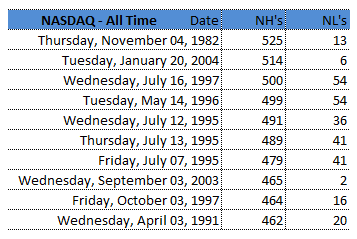 The top day, Thursday, November 4, 1982 gave us the most NH’s all-time for the NASDAQ with 525 (only 13 new lows). The NH/NL 10-d MA Diff was 222, the NH/NL 30-d MA Diff was 196, the Adv-Dec Ratio was 1,087-469 and the NASDAQ closed at 225.01, up 1% for the day. The stock market bottomed on August 12, 1982 and rose 35 percent by the end of the year as we can see in the powerful NH/NL ratio averages listed above. The NH/NL 10-d MA Diff switched from negative to positive on Thursday, August 26, 1982 and never looked back (the tally was 180-15 that day); this was also the first day the NASDAQ NH/NL Diff popped above 100 since May that year. Talk about a market timer. The list from 2009 is freshest in our minds because it’s present day data. 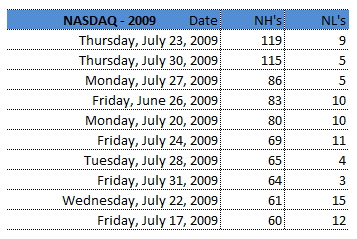 All but one of the top ten NH days for the NASDAQ happened last month with the 10th day happening at the end of June. It’s interesting because the ratio is getting stronger but the leaders aren’t cooperating and we aren’t “blasting-off” with 200 & 300+ NH’s as we did in the 1982 bull, the 1991 bull, the 2003 bull or the bulls of the mid and late 1990’s. We only logged three days above 100 NH’s in 2008, enough said. If you didn’t sell your long holdings and were still trying to pick a bottom, pay attention to this data next time; you won’t get hurt so badly! The NH/NL moving averages sunk deep into the red by the fall of 2007, giving every investor the opportunity to lock in gains and prepare for the ensuing bear market. I’ve already “tooted” my own horn for writing multiple blog posts to lock in gains on this site in late 2007 and early 2008 (see here: Calling Tops and Bottoms: Trend Changes). More articles are listed below. 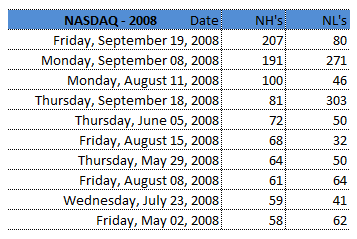 The NH/NL 10-d MA Diff went negative on Tuesday, October 23, 2007, 10 trading days before the NASDAQ’s ultimate top. The index went on to drop more than 40% in one year and 55% to the bottom. Once again, pinpoint accuracy for the NH/NL data. Not much to talk about in 2006 – it was an average year with ups and downs but nothing drastic and not too much trending using this indicator. 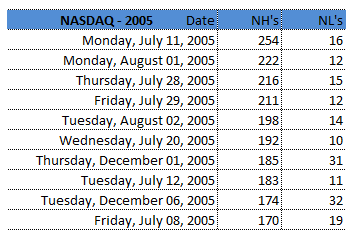 A drop in the markets took place in the summer of ’06 which the NH/NL’s picked up. This year was similar to 2006 as the NH/NL data was fairly quiet with no extremes in either direction. 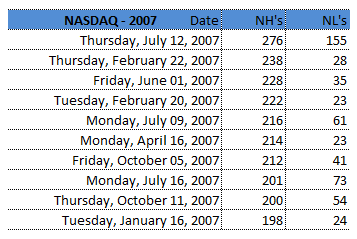 This year’s NH/NL data started off extremely strong with the second highest NH daily total ever for the NASDAQ. 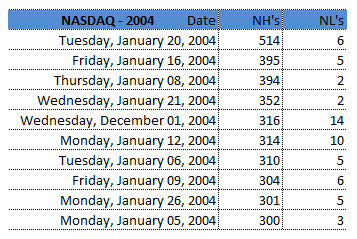 Nine of the top ten NH days came in January as the bull market of 2003 (recovery from bubble burst) was coming to an end. The market reached a top in January and didn’t surpass these levels until the following winter. January of 2004 gave us 6 days with a NH/NL 10-d MA Diff above 300, 5% of the total number of times this has happened to the NASDAQ over the past 30 years (128 total times). 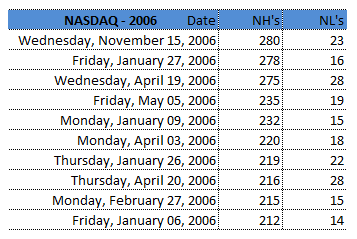 The bull market of 2003 gave us some of the strongest overall (average) NH readings of all-time. 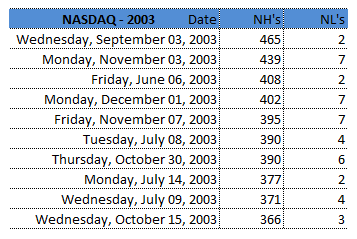 Wednesday, September 3, 2003 is the 8th highest daily total ever (only 2 NL’s that day for a 99% NH/NL ratio rating). The NH/NL 10-d MA Diff turned positive for the first time on Wednesday, March 26, 2003 while the NH/NL 30-d MA Diff turned positive on Tuesday, April 8, 2003. The up-trend started in March and blasted off in April, once again proving that the NH/NL data is pinpoint accurate – better than any stochastic, oscillator or other market tool available. We can’t argue with history. In closing, the difference between the past turning points and 2009’s turning point is that the former up-trends quickly showed many consecutive days of more than 100+ NH’s, soon to be 200+ NH’s per day. 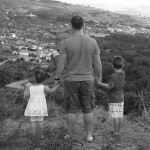 This year has failed to do that time and time again. Until it does, we’ll wait patiently and continue to watch the data, looking to pounce on the signal! Don’t forget to subscribe to my free blog feed so you can get my blog updates e-mailed directly to you or listed on your RSS home page. Maybe 1974 is a better comparison to today’s market. Just out of curiosity, how did these numbers appear for the NYSE in 1973-1975? Do you see the NH numbers getting stronger and if so, could we see an even larger v-shaped recovery. Or, because these numbers haven’t been strong and the leaders aren’t emerging, are we due for a substantial pull-back? I can run some reports for the NYSE 1970’s data – I don’ have it formatted at this time, it’s still raw. The number are trending higher but I can’t predict. What I do know is that they aren’t as strong as any of the past up-trends over the past 20 years and leaders aren’t coming to the surface as they have in the past. Do you think you can guide me to an article on how to construct a NH/NL chart? One thing I’m not sure of is which high or low do you pick? Is it 52 week high? Or high of day? Or week? Plot daily NH’s and daily NL’s for simple chart. Add the daily new highs and subtract the daily new lows to get the differential. That’s what gets plotted for a “Diff” chart. Where can I find the data to contruct a chart the NH and NL? I can find todays data, but I can’t find the data for previous days or previous months or years.